At Upic, we need to market just like any other business. 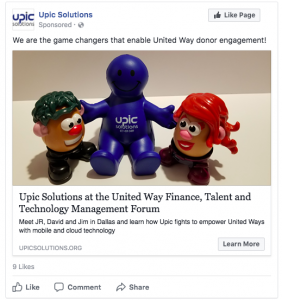 We started digital marketing prior to the United Way Finance, Talent and Technology Management Forum, and want to share some of what we’ve learned. Our key takeaway thus far is that we’ve been able to target significantly more than 75% of our desired audience, in 48 hours, with a budget of about $20. This was all done without a single stamp or filling someone’s inbox. As they say in real estate, the three most important factors are location, location, location. In digital advertising, it comes down to data, data, data. Sure, you need the right message — but that message has to get to the right people. As 68% of US adults have a Facebook account — many populated with likes, dislikes, and a myriad of demographic and psychographic data — they make it easy to target your constituents and those with similar interests. Facebook ads are displayed to a specified audience across device types (mobile and desktop) and sites (Facebook, Instagram, mobile apps, and other popular websites using the Facebook Audience Network). While there are a variety of ad types, a typical image-based ad consists of an image with a headline, text and a call to action link to a landing page (like this blog post). The ad will look different, depending upon where and what type of device it is displayed on — but the simplicity is in the ability to create one advertisement that can span many device types and sites. Ad content will vary, but can be quickly generated with an eye-catching image along with text that grabs the reader’s attention and a relevant call to action. This is relatively simple for any marketing team (and for any amateur marketer who wants to write a blog post!). With Facebook advertising you can communicate with volunteers and donors who have moved, changed jobs or ignore their email. You can target individuals using the data you have, combined with the data Facebook has. There is real power here to reach out and engage with your community. If you found this post interesting, come get a smiley blue guy at the United Way Finance, Talent and Technology Management Forum in Dallas. JR, Jim and I would love to discuss how technology can transform United Way processes and operations.